WASHINGTON, DC, November 17, 2014 (ENS) – The United States will contribute up to US$3 billion to the Green Climate Fund to help developing countries respond to climate change, and Japan will give up to US$1.5 billion, the leaders of both nations announced at the G20 Summit in Brisbane, Australia on the weekend. 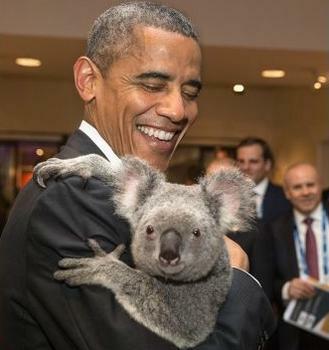 “Along with the other nations that have pledged support, this gives us the opportunity to help vulnerable communities with an early warning system, with stronger defences against storm surge, climate resilient infrastructure, to help farmers plant more durable crops” said Obama at a G20 event. 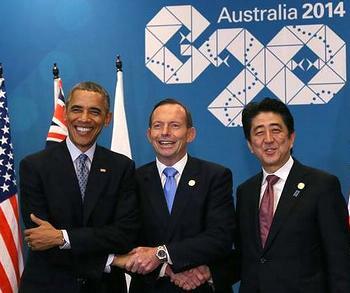 The new commitments were jointly announced by President Obama and Japanese Prime Minister Shinzo Abe in Brisbane on Sunday. “By announcing significant pledges promptly and at the leader level, we aim to provide great momentum to the ongoing climate change negotiations toward a post-2020 agreement that is applicable to all, in which countries make ambitious and transparent commitments to reduce their emissions,” said Obama and Abe. The new Green Climate Fund, GCF, with headquarters in Songdo, South Korea, has received early pledges from 13 nations, totaling US$7.5 billion equivalent. The pledges have come from Germany, France, and other donors, including developed and developing countries. “This week’s announcements will be a legacy of U.S. President Obama. It will be seen by generations to come as the game‐changing moment that started a scaling‐up of global action on climate change, and that enabled the global agreement,” said Cheikhrouhou. Back in Washington, President Obama needs the Republican Congress to approve U.S. contributions to the Green Climate Fund, a position that puts him at odds with the strengthened Republican leadership. Republicans won enough Senate seats in the midterm elections earlier this month to seat a majority in both houses. For years McConnell has fought regulations imposed on coal-fired power plant emissions by the U.S. Environmental Protection Agency. To date he has been unsuccessful as the courts, including the U.S. Supreme Court, have upheld the agency’s authority to impose limits on greenhouse gases responsible for climate change. Much of McConnell’s support comes from the coal producers of Kentucky, a state where coal generates nearly all of the electricity. He could attempt to cut the EPA’s budget to hobble its environmental enforcement. And he could tack such amendments onto crucial budget bills as he has in the past, raising the spectre of a government shutdown. And McConnell is unlikely to support a U.S. contribution of $3 billion to the Green Climate Fund. China’s vow to fight climate change kills a basic Republican argument against U.S. climate action – that if the world’s biggest CO2 emitter won’t curb emissions, the United States should not do anything either. The Green Climate Fund pledging event coming up on Thursday happens just 10 days before the annual United Nations climate summit in Lima, Peru. There world leaders are expected to draft the global, legally-binding agreement that will limit greenhouse gas emissions to avert the worst consequences of climate change.